Boracay is undoubtedly the most crowded beach in the Philippines. 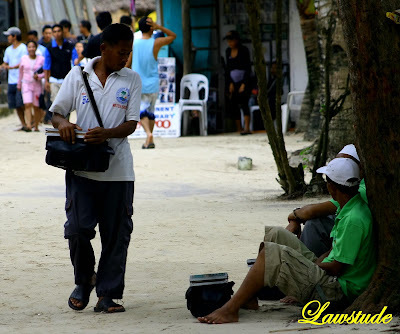 Aside from its really fine features (the sand, the sea, the views) - what makes Boracay stand-out are the People who frequents or inhabits the place. As a tribute to them, I am now posting here People you will see and encounter in the place. The BabesComes in different shapes. The LoversComes in different kinds. The HunkComes in different sizes. The CombersComes in different colors. The Retiree and his CatchComes in different richness. The MasseusesComes in one flavor - coconut. The LovelessComes in different state of mind. how many paparazzis peeping through the bushes? hehehe! i guess i don't have to say that you really enjoyed your time. more photos please! Unas playas preciosas, me encantan esas arenas tan blancas acompañadas de ese agua cristalina, buena serie dan ganas de ir para allá. I really enjoyed this post and the pics. I think it was great!! :-) I think I'd be that last one but I'd have my camera in hand. very weel done post, excellent. man, that was funny. can't get over it! hahaha... astig post! yan nga ang typical views doon. laging maraming tao kahit off peak. ano na lang pag peak?! I like pictures with sites and people full of life! Great shots! What a great post and so true many of your observations!!! Hmmm...wouldn't you know? It's alot better to see the nature behind those people. They do not have categories...except pure beauty. No perceptions, no stereotyping, no prejudices. I'm glad you're a nature photographer... and hope you won't get enough of nature until it gets enough of you (which will not happen I'm sure) ... have a nice day! natawa ako sa captions. hehe. galing! paparazzi nga dating mo sa post na to. your subjects should be thankful kasi nakunan sila ng picture ng isang magaling na photographer. hehe. So sad about the rich old guys and the beautiful young women - my friend travels to Thailand often and sees that everywhere there & the families have to condone it because they need the money. Wish the more girls had better opportunities. BTW - I forgot to say that you did an excellent photo journal! he he. since wala ka sa pics, i surmise di ka kasali sa loveless.. baka dun sa lovers pero me special caption: "the honeymooners; comes in different positions". ahehehehe! clever way of categorizing the flock of boracaynons! haha. you can actually add a subcategory to "the lovers": "korean couples"--they tend to dress alike! hehe. I like the descriptions that you wrote to every pictures that you posted..they fits according to the angle....so funny..
Hahahaha... I like this series... so you have the guts...congrats! The retiree and his catch usualy makes me sick! Saw a whole lot of that in Brazil too. very courageous of you lawstude. More pictures of hunks , please! ;) Nice entry, certainly something unique and different from what you normally do! Look the colour of the sea!!! and plenty of humour in the subtitles. great work! well, first time q po un. newbie po aq s blogging. I can very well relate to the last pic's title. Haha. this is a fabulous post. love that you also featured your fellow visitors. LOL on the loveless. i thought that was funny. I love your pictures Dong. When you visit Marinduque, drop by at Chateau Du Mer for free coffee and conversation. Are you a professional photographer?. I may have a small project for you regarding my beach resort in Marinduque. parang bagay sa akin yung loveless! Hahaha! I want to mention your blog. I hope you won't mind. Your blog rocks! I fit in the last category.You? Lawstude, galing mo talaga idol! I like this or can I say candid shoot.Perfect picture. Nice pics..you have more shots of the babes? hahaha. ok ang mga caption. marunong ka pala magpatawa attorney. I've to go to Boracay! It's really beautiful. I'd say it's very commercialized pero worth the money and time, di ba? LOL, this is a humorous and nice post! Made me smile! Thank you!